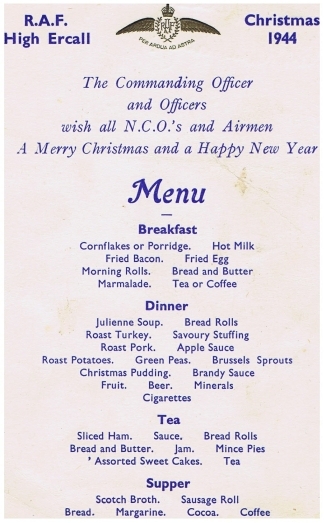 Many thanks to Margaret who kindly sent me this menu from 1944. She said her father was in the RAF and mother WAAF but was unsure which was stationed at Shawbury but thinks it may have been her late father, William (Bill) Hay. 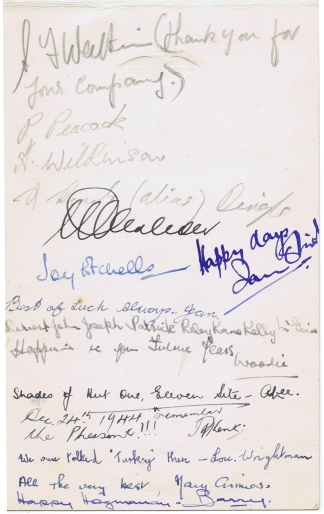 The above menu with several signatures of those attending the dinner. This is how ex RAF High Ercall runways are looking today. All these were taken on the 01 June 2007 between about 1630 and 1800. High Ercall had 3 solid runways. This first picture is standing close to 29 threshold and looking down towards Walton. This runway was 1591 yards or 1454.8 metres in length. The building that can bee seen is a grain store and sits on the 11 threshold. Runway 11/29 was the main runway as beyond the grain store and over the lane used to stand the Main Beacon (Localiser ? ), with the Inner Marker at 29 end, its also the runway that ran square with the control tower. Standing at about 05 threshold, only a short narrow strip remains at this end. This runway was the second longest at 1412 yards or 1291 metres in length. I were unable to determine exactly where this point was but as near as I could work out it was likely the 17/23 intersection. This is looking back to 05. In front is Cotwall Bank and just out of shot is the church. Same point as the photo above. A bit of guess work based on compass and visuals. This would have been runway 17/35. Runway length was 1278 yards or 1168.6 metres. I couldn't get to where I thought 35 threshold would be as the perimeter track leading to 35 threshold and 17/35 have been dug up. To the right is the Wrekin. Its my intention to try and do these again when the fields have been harvested as it will probably be easier to see the surrounding area and more of the concrete and tarmac. An area map showing the runway layout can be seen here. The panorama photos have some shots looking down on to the airfield. An advert for the sale of the various airfield sites. Most of the Airfield returned to farming as can be seen in the pictures above. The Headquarters site (Main site) became the RTITB MOTEC 1 (Multi Occupational Training and Educational Centre) and later Centrex and is now owned by the Angel group. The Sub Sites with the hangars became warehousing.